This weekend was my friend Peter’s birthday and I promised him a carrot cake (his particular favorite). I made a magical carrot cake transporter. 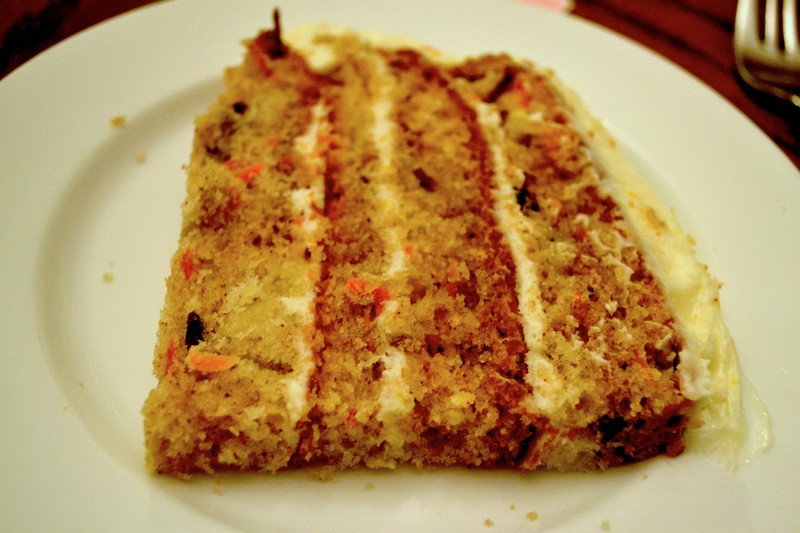 Carrot cake is one of my favorite cakes to make and I prefer cream cheese frosting over buttercream or whipped frosting. This particular recipe is courtesy Martha Stewart. I started this recipe on Friday night after a particularly long, hard week at work and school. The new job is exciting and draining, not leaving much time for cooking or even eating. I’ve lost about four pounds since starting this job, which I am happy about, but I wish I did have more time in my day to fuel my body. I’ve broken down a couple times because my blood sugar has been so low. I was excited to bake this cake. I’ve been looking forward to baking something for a while now. This recipe caught my eye because it takes you beyond the typical carrot cake with walnuts and raisins. It contains ginger and toasted pecans instead of raisins and walnuts. I love ginger and prefer pecans over walnuts. 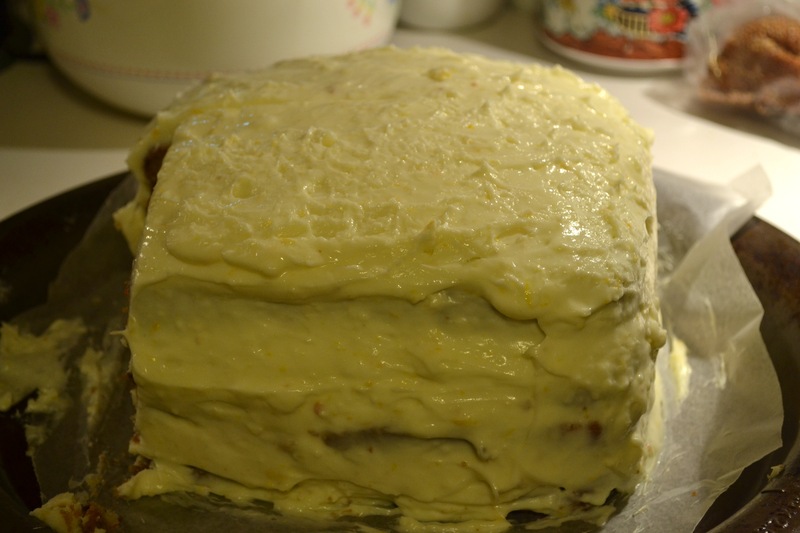 The orange-ginger cream cheese frosting was just perfect, particularly since this cake is not the typical moist carrot cake. This was four layers of deliciousness. I was happy the cake wasn’t overly sweet because this frosting is quite sweet. I thought the cake turned out hideous, but everyone else seemed to think it was beautiful. The first couple bites of this sandwich were absolutely amazing and then as I started eating more if it I started feeling overwhelmed by the richness of it. The idea was a good one, but I think to get to a perfect finished product it definitely needs some tweaking. Yesterday our class had an end of the year party. Most of the parents brought the typical ham and cheese/turkey and cheese sandwiches, but one mother (who is a champion against school lunches and an amazing artist) brought quesadillas. These quesadillas were bomb (yes, I grew up in the mid-nineties). They were whole wheat tortillas with ricotta, mozzarella, and spinach. I ate two of them. I wanted to go back for more. I was thinking about the different kinds of things that I could do to quesadillas and sanwiches. I was thinking hmm…I have pizza sauce in the freezer, I have olives, I want greens on it: a pizza salad sandwich. I want something creamy, but ricotta can be expensive…cream cheese! 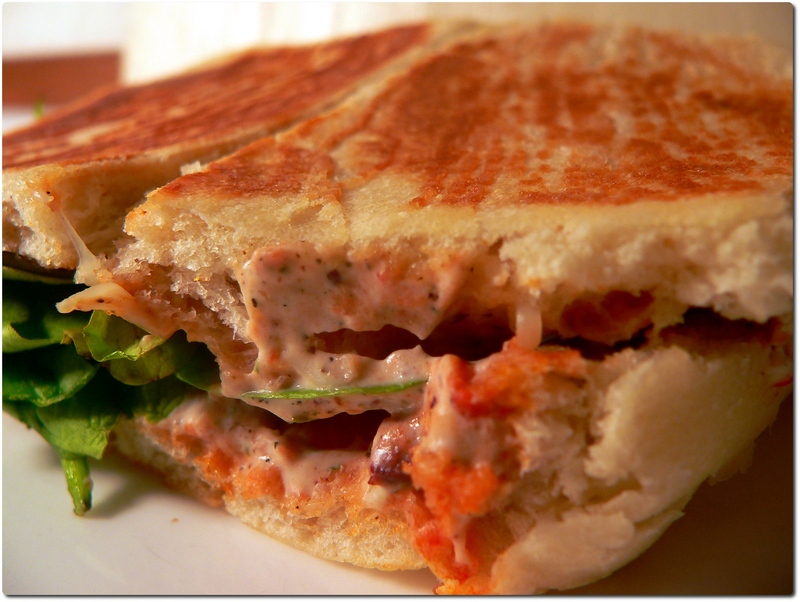 Here it is folks, The Creamy Italian Sandwich. 1. Gut your bread. This means tear out all the soft insides of the bread leaving mostly crust behind. This is to your sandwich isn’t too bready. I know, this may make you sad. I love bread too, but there is a lot of other stuff going on in this sandwich to make up for it. 2. Put cream cheese in a bowl. Add pesto, sliced olives, and black pepper. Mix with a fork until well combined. Now, after eating the sandwich I think two tablespoons of cream cheese was overkill and the pesto unecessary. Next time I would reduce it to one tablespoon of cream cheese or go with ricotta. 3. Spray olive oil into pan. Spread one tablespoon of marinara/pizza sauce on bread. Spread half of cream cheese/olive mixture on bread. Place in pan. Sprinkle half of cheese on top. Add all your greens. Spread marinara sauce and cream cheese mixture on the other slice of bread. Sprinkle cheese on top of the greens. Add the other slice of bread. Squish down. 4. Put pan on burner and heat to medium. Place a cast iron skillet on top of the sandwich and press down. I suppose you could do this in a panini press or even a waffle iron, if you’ve got fancy stuff like that. I have a cast iron skillet so that’s what I used. Check every couple minutes to make sure the sandwich isn’t burning. Use this time to clean up. Once you smell toastiness, remove the cast iron skillet and check the bottom of your sandwich. If it’s golden flip it and then replace the skillet for another minute or two until the other side of golden. Then dig in and enjoy. Congratulations to the Saints for winning their first super bowl. That interception was great and I think Peyton Manning was crying. My friend Katie hosted the game at her house and we made bbq. Andrew (my boyfriend) and I brought over wine and garlic marinated tri-tip from Shopper’s Corner, homemade baked beans, and Heifeweizen. The baked beans attacked me on the way to Katie’s house and I received some burns. I’m very accident prone. 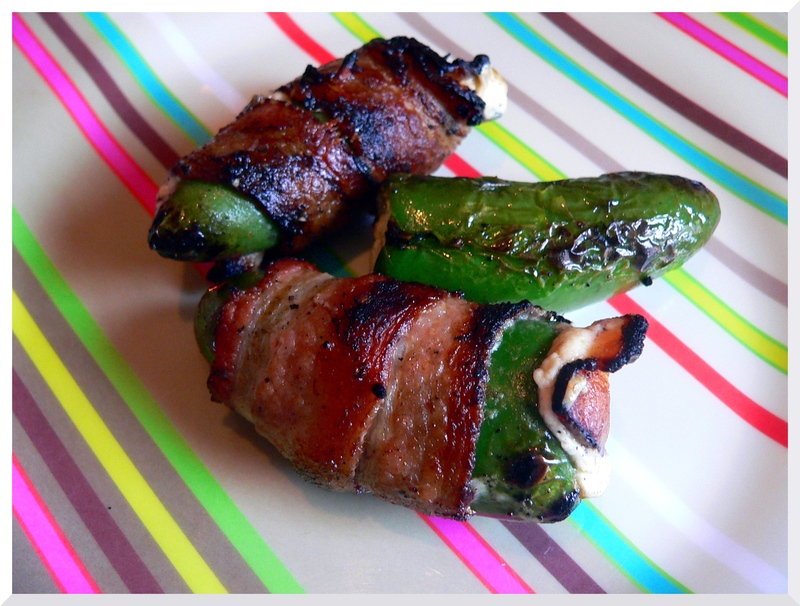 My friend Richard made jalapeno poppers. These were made with jal apeno peppers, cream cheese, and bacon. He sliced the peppers lengthwise, scraped some of the ribs and seeds out to cut down on heat, and filled them with cream cheese. He then wrapped them in bacon and secured the bacon with toothpicks. These were placed on the grill for about twenty-five minutes. The bacon caught on fire at one point. Richard cut himself while making them. It was a day for accidents. Katie made pulled pork sh oulder which is her specialty. It was delicious. She served this with Hawaiin rolls. I’m not sure exactly how she made the pork shoulder, but generally she does worcestshire sauce, garlic, salt, and pepper and puts this in a big covered dish in the oven on a low temperature for about three hours. 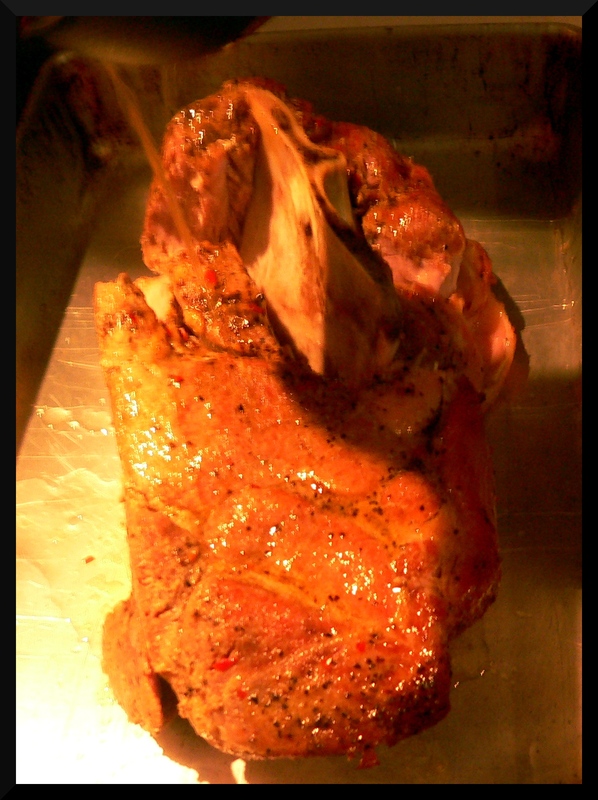 Then she slathers it in bbq sauce (this time Stubb’s brand) and then put in a roasting pan over the grill for another half hour or so. She pulls the pork apart with a couple of forks and adds more bbq sauce. Andrew cooked the tri-tip on the grill for about forty minutes. It came out delicious. 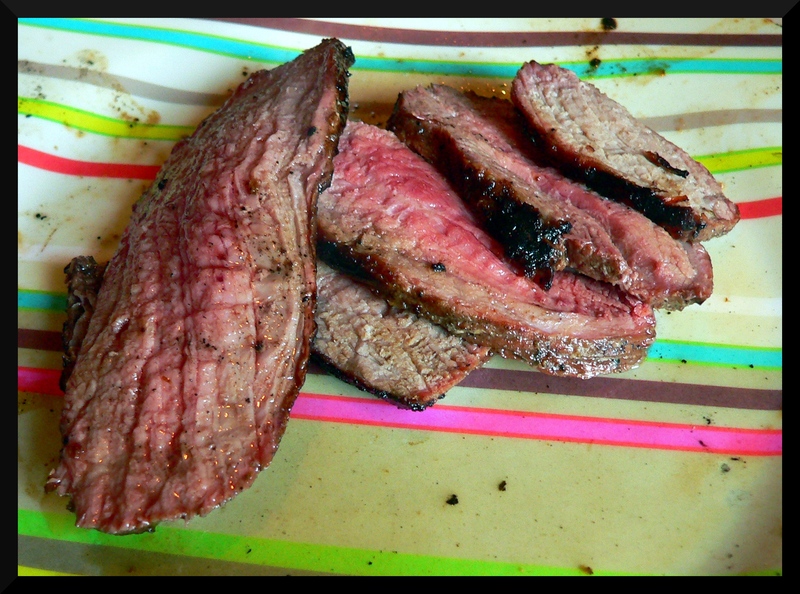 The wine and garlic marinade makes for the best tri-tip. Now making home made baked beans was quite an ordeal without getting burned by them in the car. I used dried pink beans. I did not soak my beans overnight. You are supposed to soak them overnight so you get a better texture and a quicker cooking time. They cooked quickly enough for me even though I didn’t soak them. 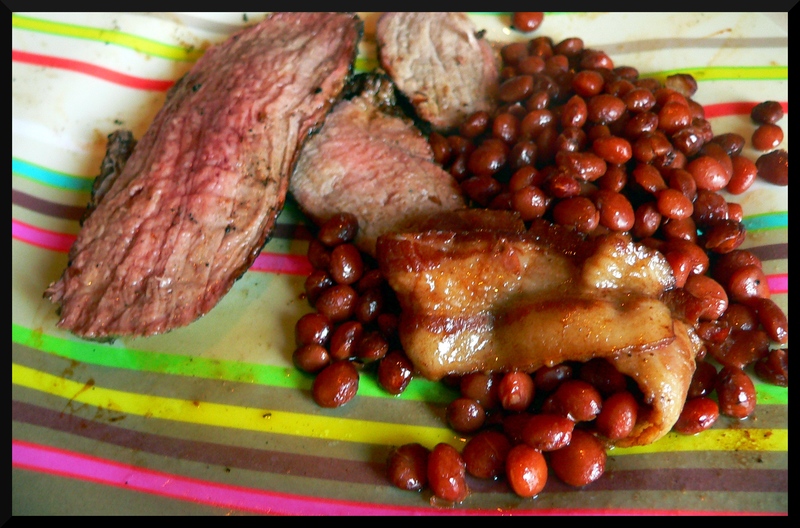 I made a recipe called Boston Baked Beans from the North American section of my Around the World cook book. 1. Place your beans in a large pot and cover them with cold water. Bring this to a boil. Boil for about ten minutes then reduce to a simmer. Cover with a lid and simmer for an hour and a half to two hour s. Pre-heat oven to 275° F.
2. Chop your onion into large chunks. Place these into a large casserole dish. Pour half the beans into the casserole dish. Place the bacon on top. Pour the rest of the beans on top of the bacon. Mix molasses, sugar, salt, and pepper into boiling water. Pour this onto the beans. Cover with a lid or tin foil. 3. Cook beans in oven for four hours. During the last half hour uncover. Do not spill the liquid out while getting into a car and burning yourself.